Vertigo is a term used to describe a feeling of spinning, unsteadiness or dizziness in the head, which usually occurs during movement. Some people with vertigo feel like they are moving while their surroundings are staying still, while others feel like their surroundings are spinning, but they are still. These sensations may last only a few moments, or several hours or days at a time. Vertigo can affect anyone, but is most common in elderly people. Many different conditions and diseases can cause vertigo. Cases can be grouped into two main types: peripheral vertigo or central vertigo. Peripheral vertigo is caused by a problem with the inner ear, which is the part of the body that controls balance. 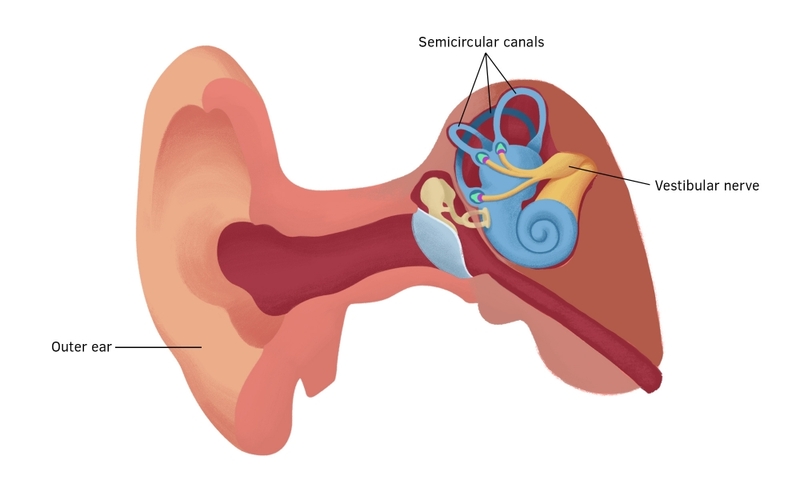 The inner ear is made up of a series of semicircular canals, which are known as the labyrinth. These canals are filled with a fluid that moves around during the movement of the head. The fluid conducts a signal along the vestibular nerve to the brain, which is interpreted as information about the direction and speed of the head movement. Anatomy of the inner ear. Benign paroxysmal positional vertigo is a condition that occurs when small crystals form in the canals in the inner ear. These crystals can move around in the canals when the head changes position, interfering with the balance sensors in the inner ear and causing the sensation of spinning, rocking or unsteadiness. Meniere’s disease is a condition that may be caused by a build-up of fluid in the inner ear. This can interfere with the balance and hearing mechanisms. Vertigo is one of the main symptoms of Meniere’s disease. Someone with this condition may also experience hearing loss, a feeling of pressure inside the ear and an abnormal ringing sound inside the ear, which is called tinnitus. Inner ear infections, caused by bacteria and viruses, can cause inflammation of the vestibular nerve or the labyrinth, the parts of the inner ear that coordinate balance. This inflammation can interfere with the information that is sent to the balance sensors in the inner ear, which can cause the feeling of vertigo. Central vertigo is caused by conditions that affect the area of the brain involved with balance. It can be caused by a severe headache (migraine), a stroke, a tumour or other brain disorders such as multiple sclerosis. It is common for central vertigo to be related to a problem with the cerebellum, which is the part of the brain that controls the coordination of balance and movement. Take certain medications, which include sedatives and medication used to treat high blood pressure (hypertension). The length of these symptoms can vary from person to person, but they may last from a few minutes to a few hours or even days at a time. To diagnose vertigo and identify its cause, a doctor will usually ask questions about a person's symptoms and medical history, including how often they experience vertigo and how long it lasts. During a physical exam, a doctor may check the person's blood pressure and look for abnormal eye movements or vision problems. The doctor may also use simple hearing and balance tests and arrange for imaging scans, such as a computerised tomography (CT) scan or magnetic resonance imaging (MRI) to work out whether the vertigo is caused by abnormalities in the inner ear or brain. These scans may be ordered if a central cause such as a stroke, tumour or multiple sclerosis is suspected, or if the diagnosis is not clear from medical history and physical examination. The treatment for vertigo usually depends on what is causing it and how bad it is. Treatment of benign paroxysmal positional vertigo usually involves a procedure performed by a doctor, called the Epley manoeuvre. 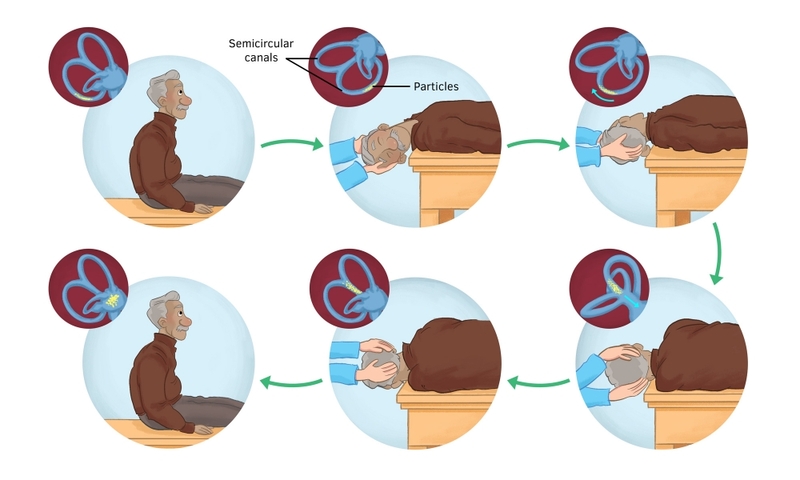 This involves adjusting the position of the patient's head in several slow steps to try and move the crystals in the inner ear that are causing the condition, away from the balance sensors in the inner ear. The patient may also be taught certain exercises to do at home. If symptoms are very severe and frequent and do not respond to the Epley maneouvre, then surgery to block the part of the inner ear causing the vertigo symptoms may be recommended. Unfortunately there is no cure for Meniere's disease, but there are some treatment options available for the symptoms. Antinausea medication may help reduce nausea and vomiting during episodes of vertigo. In severe cases, surgical procedures can be performed to reduce symptoms. In many cases, inner ear infections will improve on their own. If the infection is caused by bacteria, antibiotics may be prescribed. In the case of a viral infection, corticosteroid medication to reduce the inflammation may be prescribed. To treat vertigo associated with a migraine, a doctor will work with the patient to find the triggers that bring on a migraine so they can be avoided. Certain medications, such as aspirin and paracetamol, may help to relieve some of the symptoms of a migraine. A doctor may also recommend some specific exercises to help make the person's balance system less sensitive to motion. The prognosis for vertigo depends on what is causing it. In many cases, vertigo that is associated with problems of the inner ear will usually improve on its own. Medications and rehabilitation exercises may also be able to provide some relief during episodes of vertigo. If vertigo is caused by a problem within the brain (central vertigo), the outcome is dependent on the degree of damage done to the central nervous system. If someone has a condition that causes vertigo, it is important that they take care to avoid losing their balance and falling, as this can lead to injury. The sensation of vertigo may be avoided or lessened by avoiding sudden movement, getting up slowly and sitting down when feeling dizzy.